Promised Land means well, but the story, characters, and visuals are all so bland, generic, and nondescript that the experience feels empty. Gus Van Sant, Matt Damon, and everyone else involved should be capable of much more than this. If you know absolutely nothing about the benefits and dangers of natural gas, fracking, and the methods corporations use to buy potentially fruitful rural land, there is a chance you may find Gus Van Sant’s Promised Land intriguing. There is very little potential enjoyment in the areas of story, character, or general dramatic effectiveness, but it does present some mildly interesting points on the fracking controversy, and until the final twenty minutes, it does so in a fairly levelheaded way. But I cannot imagine there are many people willing to sit through Promised Land who are unaware of the fracking debate, and fewer still who are likely to have their opinion swayed by the film’s argument. I personally agree with just about every point the film makes, but that is not nearly enough to hold my interest, especially when everything surrounding the environmental material is so rote, predictable, and utterly, mind-numbingly generic. 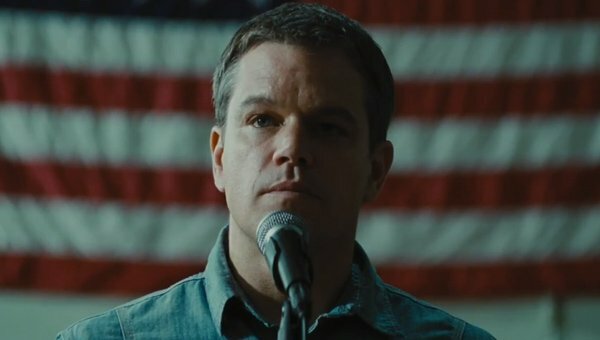 Matt Damon – who co-wrote the film with co-star John Krasinski – stars as Steve Butler, a salesman for energy corporation Global, who has come to a rural town with partner Sue (Frances McDormand) to buy drilling rights from local farm owners. Steve and Sue expect it to be a routine assignment, but when an environmental activist (John Krasinski) arrives to inflame passions against fracking, the pair soon find themselves in crisis mode. The film pretty much plays out exactly as one would expect it to from there, albeit with one spectacularly stupid, nonsensical twist near the end that throws impartiality to the wind in favor of cartoon villainy. Apart from that, this is a simple moral play for Damon’s character, who seems aware of the dangers of fracking but is more interested in boosting the economy of the town. That is certainly the film’s most interesting point – that in tough times, environmentally hazardous operations such as this are appealing to small communities – and there are moments of genuine, complex emotion here and there as Steve and the townspeople grapple with their needs and means. Otherwise, you have seen every single beat the film has to offer played out before, probably more effectively. The key to making this sort of story work lies in characterization, and the script’s ultimate failing is its inability to produce much enthusiasm about the people on screen. Talented performers like Rosemarie DeWitt, Hal Holbrook, Titus Welliver, and Scoot McNairy all appear as various townspeople, but each is written as little more than a ‘type,’ and no one is able to transcend the limitations of their parts. Frances McDormand’s role is similarly thin, disappointing considering what a strong presence she brings to the movie. By the end of the film, I had no earthly idea what motivated this character beyond a simple paycheck, and if that is all there is, it is not enough to make for an interesting central figure. Damon does better writing for himself, and is plenty good as Steve, but there never seems to be any clear reason why this character would be so passionate about natural gas, nor why he beats himself up so thoroughly over this one particular town. 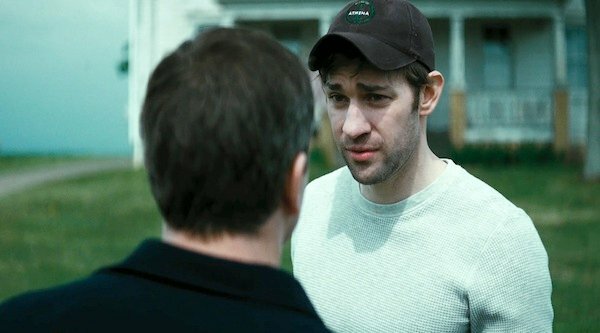 John Krasinski is practically a non-entity, I am sorry to say, present only for enough time to give the pitch against fracking and serve as center of the dumb third-act twist. As far as technical credits go, Promised Land is impressive only in baseline competence, and that’s surprising coming from a director as accomplished as Gus Van Sant. The cinematography is decent, and offers pleasant imagery on occasion, but there is absolutely nothing to set this apart from a well-produced episode of TV drama, no distinguishing characteristics or strong sense of voice that stands out as anything more than mediocre. From musical choices to set design to costuming, every element of the production is so nondescript that anybody could have directed it; there is very little life or vitality to the film, no visible effort on Van Sant’s part to punch up the dry and mechanical screenplay. It’s disappointing, because I like everyone involved with this film an awful lot, and know from past experience that each is more than talented enough to make something special. But the best I can say about Promised Land is that it is innocuous and inoffensive, and this group of artists should be able to achieve a lot more than that. The film wants to be meaningful, wants to have topical significance and emotional heft, but it arrives mostly empty, and in a year filled with great and memorable films, Promised Land is not worth anyone’s attention.